Mojo Compression Sports Sleeves provide ankle to- calf graduated compression. Best for athletes who do not wish to change from their current running or riding socks - but still want the protection and improvement a graduated compression garment offers. Use the Compression Sleeve in conjunction with your favorite socks to improve endurance by boosting blood circulation and delivery of oxygen to your muscles. You'll run and ride with less effort, increased speed, decreased recovery time, reduced fatigue and optimized performance. Our Radical designs and colors keeps you stylish - on the road - at the gym - or recovering at home. Mojo Compression Sleeves feature 20-30mmHg graduated compression. Strongest at the ankle gradually decreasing up the leg. Used by professional triathletes around the world, these are scientifically proven - to maximize power, boost energy, and speed recovery time. I like them as I'm on my feet all day cooking and they help with the circulation in my legs. I legs don't get as tired. Plus they help with my circulation when walking. I will find a person that can use these since my legs are possibly too large for the XL size that I ordered. Disappointed. 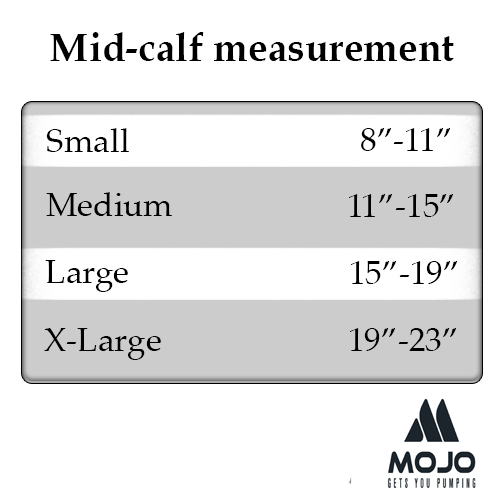 I have been wearing several models of the Mojo calf sleeves for my varicose veins at my doctors recommendations. I have found the calf sleeves to be effective and comfortable and preferable in the warmer weather.